Dynamite Threads: Custom movie outfit for Sonali. I finished this outfit this morning. As luck would have it the sun peeked out for a few minutes so I could take pictures outside. It's been raining and thunder storming here for days, please pardon the very long grass. Sonali is seen wearing an outfit much like this in a couple of scenes in the American Girl Chrissa movie. 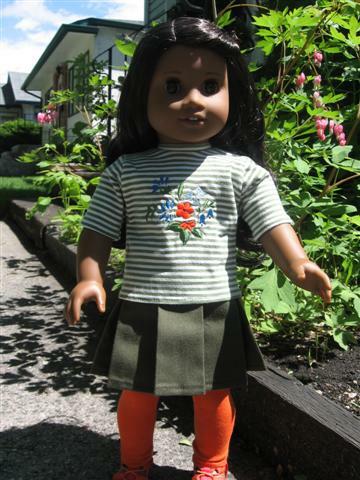 Sonali is wearing the shoes from the current gardening outfit today, but they are not included with the outfit. Brown flats would look nice too, I think. 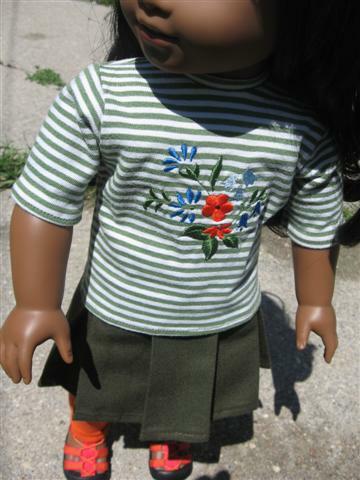 The shirt as seen in the movie has 3/4 length sleeves. 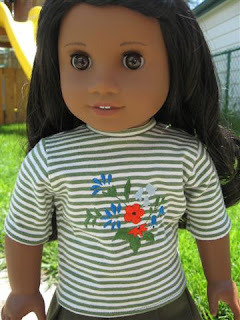 I upcycled a nice striped knit for this shirt, the colors and scale of the stripes are just right for doll size. The embroidery was made by me on my new Janome. It was difficult to see the exact design on the real shirt in the movie but it was clearly floral with a few different colors. I like how this came out! The back of the shirt. I don't care for velcro in dolls' clothing. 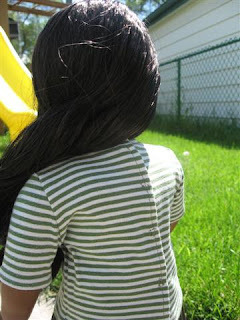 It's so hard on their hair and it's a pain to try to keep their hair safe from it. My answer to this is non rusting metal snaps hand sewn in place. It's time consuming to do this, but well worth it. 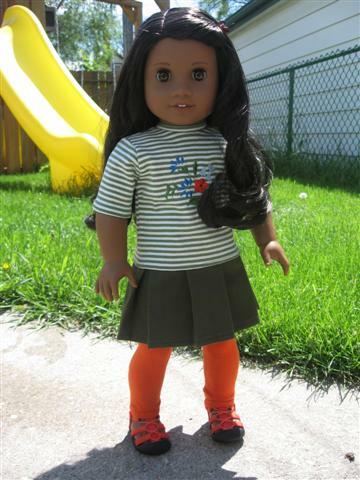 I don't leave any threads loose, everything is very secure and gentle on doll hair. The pleated skirt and footless tights from a previous entry. Thanks for looking! I changed the comment function so anyone can comment now. I think it was only enabled for people registered to this site before.